Frequently amusing family comedy: not quite as much fun as the trailer suggests, but kids will adore it and adults will find little to complain about. Using a blend of everything from CGI to animatronics to real-life animal work, Cats & Dogs is an inventive and frequently amusing comedy with a neat central idea. This being that dogs take their roles as ‘Man’s Best Friend’ very seriously and have been battling cats for centuries in order to prevent them taking over the world. Again, that is, since they apparently ruled both it and us in Egyptian times. 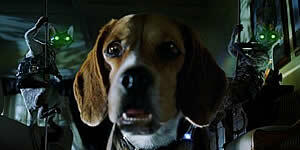 The ‘hero’ of the story is a Beagle puppy named Lou (short for ‘Loser’ and voiced by Tobey Maguire), who accidentally finds himself inducted as a secret agent assigned to guard wacky scientist Jeff Goldblum’s family. Goldblum is developing a formula that would eradicate human allergies to dogs, something the cats, led by Evil Megalomaniac Genius "Mr Tinkles" ("My name will strike FEAR into their hearts!" etc) are keen to prevent at all costs. He’s helped by a gruff special agent named Butch (Alec Baldwin) and a small group of other loyal dog agents. Although the film is occasionally a little bit too cute for its own good, there are, nonetheless, several inspired laugh-out-loud gags, chief among them involving evil super-villain Mr Tinkles. Mr Tinkles has to endure the humiliation of being dressed up in ridiculous outfits by his eccentric owner, meaning that he gets to deliver lines such as "EVIL…does NOT wear a BONNET!" Other laugh-out-loud moments include the cat ninja attack and the Russian bomb expert, particularly his "hairball surprise". It should be clear that cat lovers might be in for some disappointment, since the film is not the evenly matched fight that the trailers hinted at, instead coming down firmly on the side of the dogs. However, the dogs aren’t nearly as funny as the cats, so perhaps the balance is redressed after all. In general, then, this is a film that kids will adore, since it’s squarely aimed at the pre-teen market, particularly if the plethora of fart gags is anything to go by. Adults will have little to complain about though, as the film throws in enough film references and over-the-heads-of-the-little-ones jokes to keep them happy and never outstays its welcome, running at a scant 90 minutes. A film to take the kids to if they’ve already seen Shrek.